[RELEASE] Mental Omega 3.3 Available now! The time has come once again, the new version of Mental Omega is finally here. Furthering the Red Alert 2 legacy, Mental Omega builds on what was established by Westwood Studios and expands upon the conflict between the Allies, Soviets, and Yuri's Epsilon, while introducing a completely new faction to the play - the Foehn Revolt - complete with its own 3 subfaction, structures, units, support powers and heroes. Enhanced with the powerful Ares DLL, a project headed by AlexB to push Yuri's Revenge engine to its limits, Mental Omega 3.3 strives to bring new features to the game while maintaining a strong sense of gameplay balance. 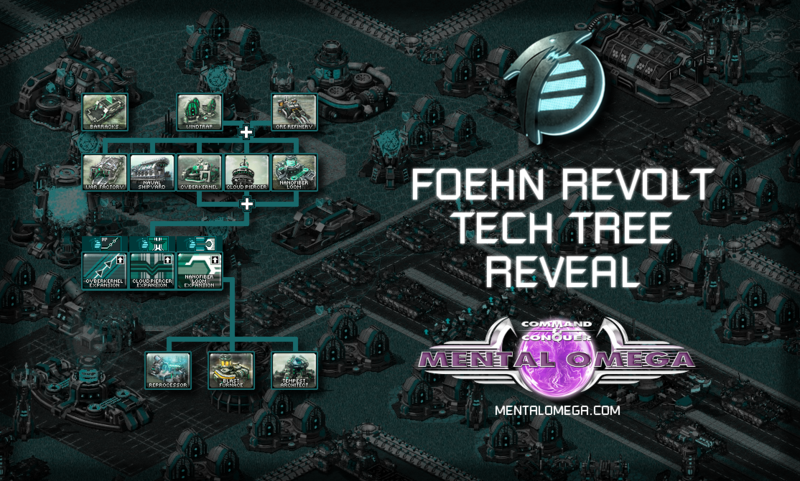 Mental Omega 3.3 continues where the first Red Alert left off and branches out into an expanded universe with brand new missions for all factions, with missions for the Foehn Revolt planned for the future. Mental Omega 3.3 requires files from a working installation of Red Alert 2 & Yuri's Revenge patched to 1.001 to be played. Follow the instructions presented here to get the mod to work properly with your game. Stay tuned for more updates! The ride is not over! Work on the next Mental Omega release continues, as we're adding and finishing new units of the Foehn Revolt. Release Date: December 16, 2016 --- READ THE INSTRUCTIONS! Remember to download soundtrack separately. Mental Omega Mission Loading Screen Template in PSD format. Useful for those who make their own Mental Omega missions. By Nooze. For mappers and modders. Maybe someone has asked this already, but does anyone know who voiced the Epsilon Stalker? That's weird, the person who voiced the Epsilon Stalker is not credited, but this should be illegal, isn't it? - you must credit someone who did something to your mod. 1. Can you use the save files now? Like, safe in the campaign? 2.Does the Germany faction exist? And does they have the Tank destroyer? 3. What are the factions of the mod. If you have time please answer. 1) AlexB managed to properly return savings with the new ARES version, which means that since v.3.3.3 you can save-load now. 2) There are no "vanilla" factions in the mod, and so, no proper German faction. But there is a sub-faction called European Alliance, which uses more options from the original RA2 assets and focuses itself on defensive operations. Also, there is no old tank destroyer available for skirmish, however throughout Allies' campaign you can sometimes use the campaign-exclusive Paladin Tank Destroyer - a very powerful successor of the original TD from RA2. 3) The Soviet Union: Russia; Latin Confederation; China. Allied Nations (Allies): United States of America; European Alliance; Pacific Front. Epsilon (basically, Yuri's faction): PsiCorps; Scorpion Cell; Epsilon Headquarters. Foehn Revolt (considering campaigns' events, the (somewhat) successor of Allies and USSR (won't spoil more in case you want to try the story)): Haihead; Wings of Coronia; Last Bastion. I won't tell you why, but if you want to know, check his mod Mental Thunder 7.5 mod (an check the mod gallery, and don't forget to read every description of an image uploaded), the assets are suspicious. 1. Epsilon & Foehn should have a different parachute for each one of them, for example, Epsilon would have a Magnetic Rocket as a parachute, and Foehn would have a Hover Rotor, as for the Soviets, a colored version of the main parachute, brick instead of gray. 2. It would be good if Epsilon had a 'Floating Disc'-like cargo plane, how about this idea? i find it fair enough but i also think the epsilon cargo plane is nice too. Don't proclaim someone's work as yours, i actually made the Epsilon Rocket Thruster and the Foehn Hover Rotor. And yes, i made the 2 already but they are not tested yet, also, if you didn't know, he used my Infector Tank cameo, so Speeder is permitted to use it. I'm waiting for the next latest patch. Easily one of the best, most professional "YR+" mods around. MO is genuinely produced as a "YR expansion", continuing the game's theme and storyline with a whole brand new campaign for all three factions. While bringing in a few new ideas and a lot of new units for the games houses (without being overcrowded), MO doesn't depart too much from the original games atmosphere - a great mod for anyone who wants 'a little bit more YR'.